Nagasena (Skt. Nāgasena; Tib. ཀླུ་སྡེ་, Lü Dé; Wyl. klu sde) — one of the Sixteen Arhats. Born into a royal family he saw that his future duties might involve him in war and judging others, so he renounced his inheritance, went to the Buddha and was accepted into the Sangha. He studied the Tripitaka deeply and was renowned for his detachment from the world. In gratitude to the Buddha he devoted his life to teaching the Dharma and helping others to attain realization. With 1,200 arhats he dwells on Mt. Vipulaparshva. 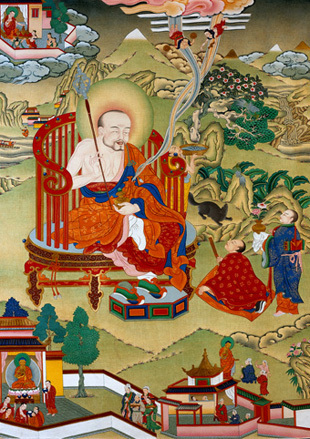 Nagasena holds a monk’s staff in his right hand and a vase which removes poverty and spiritual deficiencies in his left. Visualizing his staff and listening for the sound of its bells frees the mind from confusion and awakens confidence in the Three Jewels. This page was last edited on 12 December 2016, at 13:16.